Following an eventful photo safari to Uganda with my wife and friends that included a successful climb to view the Mountain Gorillas in the Bwindi Impenetrable Forest, I embarked on a hunting safari with Christian Weth's Uganda Wildlife Safaris (UWS) on March 16, 2010. My PH was Keith Charters of Zimbabwe who now lives near Arusha and PHs in Tanzania, July-December. 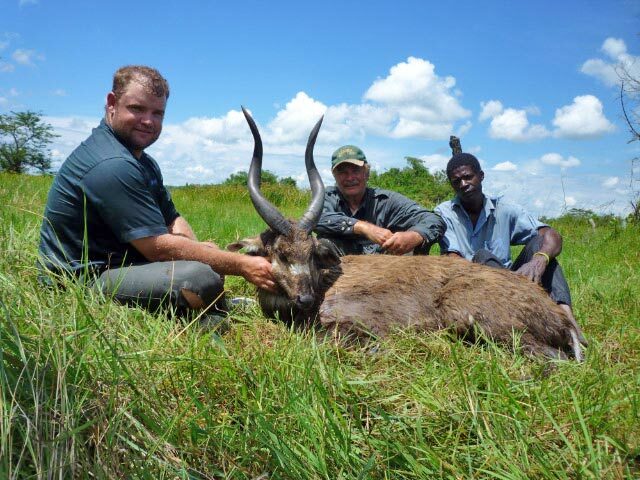 This was the third safari of the 2010 season for UWS in the first full-bag season in Uganda in 35 years. The first two safaris were 2x2 and 4x2. I was hunting 1x1 with Keith at the same time Barbara and Alan Sackman were hunting 2x1 with Christian Weth/Johnny Chipman. March 16 was a travel day to the UWS camp on the Ome River in the Aswa-Lolim Concession. 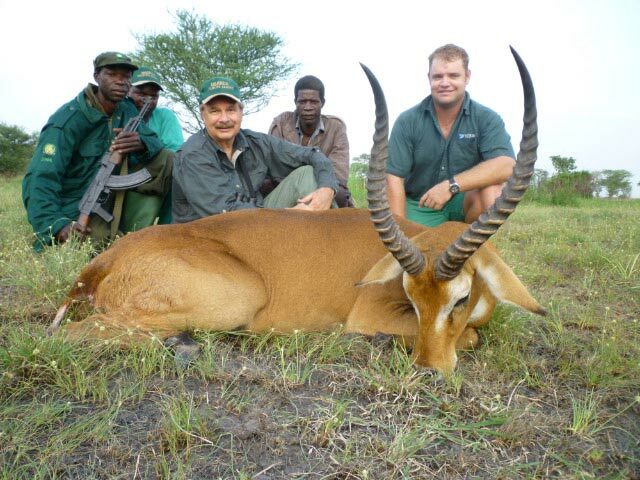 The morning of March 17, I shot a Uganda Kob of over 20 inches. We could have continued at the Ome Camp to hunt Nile Buffalo, but the bridge across the Ome was washed out, so we moved to the Paraa Safari Lodge in Murchison Falls National Park, which placed us 45 minutes from the temporary camp set-up for our staff in the hunting concession minutes from the Victoria Nile north of Lake Albert. From here, we walked in search of Buffalo tracks daily. After a two-hour search on March 22, we found the track of a single bull and followed for another two hours before I got my shot at 40 yards as the bull broke from a thicket. He was a fine specimen of Nile Buffalo with a 41-inch spread and bases worn completely smooth over the years and separated by a strip of hairless skin. Keith and I took the morning of March 23 to view Murchison Falls where the wide Victoria Nile is forced through a 23-foot wide gorge before dropping 141 feet in three cascades. Then we switched to Bushbuck Camp in the Kafu River Basin, only two hours from Kampala. 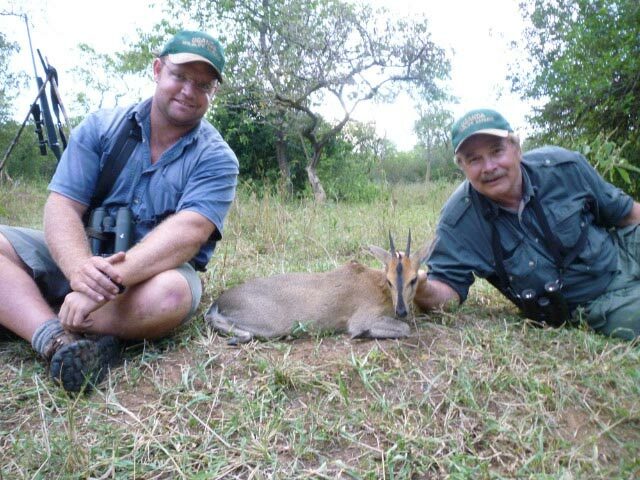 On March 24, I shot an East African Bush Duiker of 4 inches and, on March 25, I added a Nile Bushbuck of 12 inches. Two 16-inchers had been shot at this camp the previous month, but I took my Bushbuck after a two-day search because I wanted to give East African Sitatunga a good try over my last five days. On March 26, Keith and I scouted the swamps before selecting a location (where we observed eight female Sitatunga) 90 minutes from Bushbuck Camp. On March 27, we packed up a fly camp and moved to the swamps with a skeleton crew (tracker, driver-skinner, cook, and game scout). That afternoon, we spotted a good male on the far side of the swamps and decided to try for him. Our effort included building two tree machans and also wading the swamps to access islands (tree/brush covered ant mounds) in the middle. Even though we saw the horns of this bull in the tall, floating grass next to the papyrus on two additional occasions, no shot was possible. Before first light on March 30, my last safari day, Keith and I were stationed on machan #1 with our 6' 8" tracker (nicknamed Tall) standing on the ladder. When the fog cleared, Keith spotted the top of the horns of our bull near a female. The range was 290 yards. When the bull finally stood 15 minutes later, I could see his head and horns and the location of his back so that I was able to make the shot. Uganda is beautiful (truly the Pearl of Africa), and very crowded with a rapidly-increasing population of friendly people. The parks and photo safari industry are well-established and operated by the Uganda Wildlife Authority. Now it is up to a few, select hunting safari operators to develop and protect the various concessions and their wildlife. After an admittedly disorganized start in February (with the first hunters nevertheless obtaining good trophies), UWS appears to be improving their camps and organization with each safari. 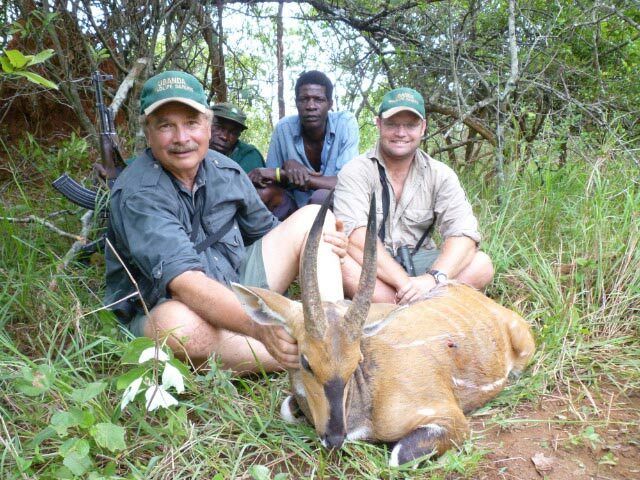 Other species available and shot by other hunters include Lelwel's Hartebeest of the Jackson's race, East African Defassa Waterbuck, Eastern Bohor Reedbuck, Oribi, and more. 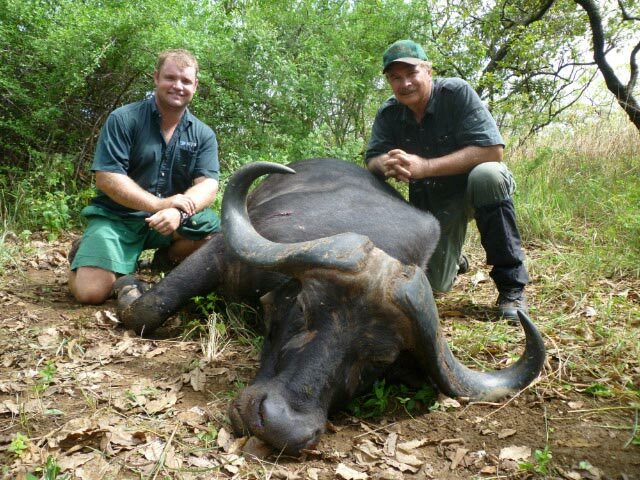 The hunting is somewhat difficult and challenging compared with many other African countries, but the rewards are great and the country is unforgettable.